The idea that golf courses in Japan with the two green system have a summer green and a winter green is not quite correct. Nor is the two green system used exclusively with one warm-season grass green and one with cool-season grass. Trevor Dormer and I had a brief discussion about this. Survey data I looked at some years ago showed 37% of courses in Japan use the two green system. That number will be slightly lower today. But I expect most courses with the two green system will have two bentgrass greens. It does vary; a busy course near Tokyo has one Champion ultradwarf bermudagrass green and one korai (Zoysia matrella) green. And there are courses with one bentgrass and one korai green. I've written about this a lot. A selection of posts on this topic are at the bottom of this page. But for now, here's what I saw on a recent trip to Japan. When I visit golf courses and talk with greenkeepers, I often ask these questions. How many holes, one or two green system, and what grasses? How many maintenance staff do you have? What is the number of rounds at this facility? How much nitrogen do you apply per year to the greens? Of the nine facilities I visited last week, here's the answers to those questions from the greenkeepers. Six gave the N rate. The minimum was 11 g N/m2/year, the maximum was 20 g, and the median was 13; 3 greenkeepers didn't have the number off the top of their head. The other data are in this chart. The median staff was 15 people, and that includes everyone -- mechanics, part time staff, office staff, etc. This is actually a bit high for Japan. I was visiting facilities skewed a little to the high end. I think the nationwide average staff will be 12 or 13 people per 18 holes. The median rounds were 44,000 per year. That seems about right. The course with 80,000 rounds has night golf and one can tee off until 21:00. And how about the greens? I visited 9 courses. Of those, 2/3 had two greens. Of those with two greens, 1/3 had one bent and one korai, and 2/3 had two bent. More about the two green system in these posts. I went for a run to the ocean at Cerro Gordo. As is my wont, I looked for grasses along the way. There were lots of zoysia lawns where I started. Then I got on a trail and headed down to the water. When I stopped along the ocean's edge, I enjoyed the view, but I didn't see any zoysia. I was reminded of the rocky shores of the islands in Okinawa. But in Okinawa, one will find lots of zoysia growing on the rocks and cliffs. This is on the western tip of Ishigaki Island. Lots of zoysia growing wild. Why is the zoysia growing wild in the East China Sea, South China Sea, and Philippine Sea, but more in maintained turf areas in the Caribbean Sea? I think the answer lies in the combination of light and temperature. Specifically, locations with a longer duration of time at high temperature combined with low light will have a prevalence of zoysia. These locations may also have zoysia that grows faster than bermuda (Cynodon) or paspalum. I looked up the combination of temperature and sunshine hours on this customizable chart. Locations on the chart to the right are hotter, and lower on the chart have less sunshine. The "trails" for each location trace the normal combination of temperature and sunshine for an entire year. I looked up cumulative precipitation too. This should have an effect too, although for competition between species in managed turf, precipitation should be less important, because irrigation can be supplied. I'd like to grow different species of grass in representative climates and measure how much they grow. I expect certain species would map to location, somewhat like the locations are separated in the chart below by temperature and light. is now available for pre-order, and I see from the Amazon.co.jp website that it can be shipped to any country. The full title is 芝草科学とグリーンキーピング (マイカの時間 The BOOK). In English that is Turfgrass Science and Greenkeeping (Micah no jikan The Book). This book is the culmination of a long project, started in 2008, writing monthly articles about turfgrass science and greenkeeping for ゴルフ場セミナー. From those articles, I've selected some of my favorites, read and reread and arranged into chapters, and now we have this book. I hope these can be available in English sometime. It is some interesting material on a wide range of topics -- greenkeeping in general, soil water, organic matter management, fertilizer, golf course playability, and more. There was another successful shiba yaki (grass burning) ceremony at Korakuen last week. More about grass burning in Japan in this post. Growing up in the golf course business in Northern Ohio I was exposed to all the mythological lore about how bad it was to allow any traffic on a golf course in winter. My father, a superintendent, ripped me when he caught me playing golf in the snow using orange golf balls in the early 1960s — he was worried that members would want to do the same. So, I was convinced at an early age that any traffic on a golf course in cold winter regions was going to damage a golf course. If you search old articles you’ll find many ‘horror stories” with scary photos of winter damage from winter traffic on golf courses. Then I experienced winters in Japan and Korea. In both Japan and Korea I’ve managed scores of golf courses where clearing off the snow and playing golf was the norm — especially in Korea! What I have found is 100% contrary to the North America scary mythology about damaging the golf course. Frankly, I have never seen 1 spec of damage to golf course in Japan or Korea caused by winter play. None. I’ve begun to think that the scare mongering of many superintendents about damaging a golf course simply from traffic in winter is an effort to not have to do much in winter! No damage. None. Use common sense and avoid big, wide heavy snowblowers — it is why we are developing our own lightweight, ‘gang’ snow blower systems. On greens use covers. Clear the snow from covers and then you can pull the covers off during the day (like they do on baseball sports fields) and recover at night. We run a business and that means we want customers and gain revenues that far offset the costs. PLAY GOLF! He sent along these photos of cover removal. And then happy golfers enjoying the course. Of course, this is not for everyone and everywhere. But neither are frost delays. I've just finished reading through a selection of 40 articles from the マイカの時間 series that I write for ゴルフ場セミナー magazine in Japan. That's 49,015 words in English about greenkeeping, water, soil, temperature, light, organic matter, playing conditions, and fertilizer. I put together this reference list for articles and books that I mentioned in those 40 articles. It's an eclectic list. You might like to have a look at these. Perhaps you'll turn up an article that you would like to read sometime. More details and the full list in this document. And here is a list of all the references. Update: I have generated the reference list again to include links to each item, and I added an item from Pat Gross. I'm bombarded at this time of year with reminders, notices, descriptions, and articles telling me about the importance of frost delays. Apparently, frost delays are essential for the health of the turf. Allow play on frozen or frosted turf, and the leaves will turn brown and start to die. In a worst case scenario, recovery from the damage could take months. This is a story about something completely different. How about no frost delays at all, and removal of snow by any possible method so the course can remain open? That's the approach used at well over 1,000 golf courses in Japan. I guess there are about 600 courses that are at such a high elevation or are so far north that they close for the winter; at the remaining courses, golf is a year round sport. I will admit, I was terrified to allow play on frosted turf when I was a superintendent in Japan. I'm sure I protested, explained how much the grass would be damaged, said I would not take responsibility for the damage, and so on. But much to my surprise, the damage was negligible and temporary. I wrote about how temporary the damage is in this post about winter traffic on frozen bentgrass. As a follow-up to that, I was asked if it mattered if it was a leaf frost or a ground frost. I said I didn't know, but I would look up the temperatures from that winter and share some more details of my experience. This was at Habu CC in Chiba prefecture. The greens were Penncross creeping bentgrass, the tees and fairways were Tifway 419 bermudagrass overseeded with perennial ryegrass, and the roughs were noshiba (Zoysia japonica). Here's the 15th in November. The course is at an elevation of 120 m. I downloaded the daily temperature data for the winter of 2000/2001 from the nearby JMA Sakahata weather station, which is also at 120 m. I think these temperatures are similar to those at the golf course. From 29 November 2000 until 2 April 2001 there were 73 days with a low of 0°C or below. I think frost can form on the leaves even when the air temperature is above 0°C, but I'll stick with 73 days as an estimate of mornings with frozen or frosty turf. In Japan, it is customary to do a two tee start, with tee times at 7 minute intervals, the golfers stopping for a meal at the clubhouse before starting their second nine. At Habu, there were about 3,000 rounds per month in the coldest months of that winter -- maybe more -- and 4,000 to 5,000 rounds per month in November, March, and April. I wanted to implement frost delays, but it was impossible. The golfers wanted to play, and the owner wanted to accept their money. Let's say for each of those 73 days with frozen or frosted turf, we did not allow the golfers to play for 2 hours in the morning. That's 2 hours of tee times off 2 tees, on 7 minute intervals, which comes to 137 golfers. Let's say the green fee was 12,000 yen. And let's lose those customers for 73 days. 137 times 12,000 times 73 = 120,000,000 yen. That's about a million USD. The only days we had to close were when we could not clear the snow. But we were trying everything possible to clear it. That's some serious money. So how about the grass? How much damage was there? On the tees and fairways, the damage was negligible. Of course traffic on slow-growing turf is going to beat it up a little bit. I did not notice that the traffic on frost or frozen ground added to that. On the greens I was really worried. Courses with more staff would typically put covers out on the greens, at least over the area where the day's hole location would be. We did that as much as we could, but we could not cover all the greens, or even cover all of a single green, with the limited covers and staff that we had. I've looked through old photos. This is the worst spot on the practice putting green in January. The putting green got a lot of traffic every morning. Pretty ugly. This, in February, is the worst spot on the 11th green, which was shaded until mid-morning in winter. That was as bad as it got. By March, even though frosts were still happening, the grass filled in. The damage had not been nearly as bad as I'd expected. 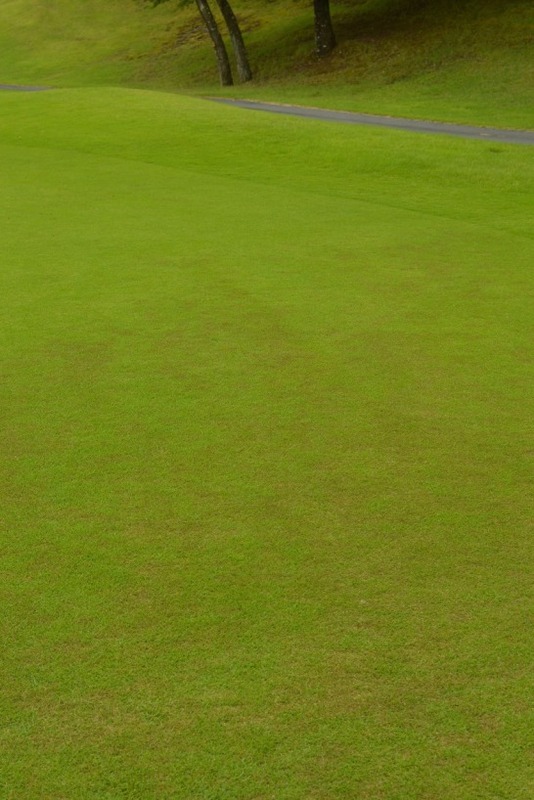 In fact, the greens were cored on March 27. But winter still wasn't over. By April, there wasn't a hint of damage from all the traffic. No grass was dead, any thin spots were gone, and the grass was growing like crazy. I'm not sure there's a moral to this story, other than one must do what is in the best interest of the facility. In the case of Habu CC that winter, it was best to have customers playing the golf course. I showed how weather data can be used to calculate a daily soil water balance. One can adjust the rootzone characteristics, and the timing and amount of irrigation, so that the calculations are representative of what one wants to know. By keeping track of what the soil water content would be on each day, given the actual weather conditions, and given the water holding capacity of the specified rootzone, one can find how much irrigation water would be required. I've also made calculations using the standard method, which takes the evapotranspiration (ET) and subtracts the effective rainfall. I've used this method before to make calculations, and it made sense to me, but I've realized that this method doesn't account for rootzone depth. For turfgrass, one should probably adjust the effective rainfall calculation for each site based on the rootzone depth. I wondered if these methods give a similar result in predicting the irrigation requirement. I had daily data from Sapporo from 2013 to 2015, and I also got the monthly averages or totals for the same time period. I've just made some calculations to find out. I looked at the months from April to October in each year. That's a total of 21 months. For the ET, the result is almost the same whether it is calculated daily, and summed for a month, or whether one calculates ET using the monthly data. For the irrigation requirement, there is not a consistent agreement. I made these calculations based on an approximation of a loam soil with a 10 cm rootzone depth, a field capacity of 40% (by volume), with irrigation supplied to return the soil to field capacity when soil water content would drop below 20%. I've got some more calculations to make about this. The standard method seemed pretty good to me until I started making the daily calculations. One can calculate a water budget for a particular location to get an estimate of how much irrigation water is required. This article from the Green Section Record describes those calculations. If one considers the depth of the rootzone, and then steps day by day through the year, the irrigation water requirement can be calculated as part of the daily soil water balance. I downloaded data for Sapporo for the past few years. Since the ground is covered in snow during the winter, I'll just show the daily water balance from 1 April to 31 October. This is for a simulated 10 cm rootzone with a field capacity of 23% and irrigation applied to keep the soil from dropping below 10%. That will be something like a golf course putting green. The blue line shows the soil water content. The black circles show the irrigation events. Interesting stuff. I don't like turf diseases. If there is any fun in them, for me, it lies in only two things. First, is it a particularly well-named disease? Second, how awful are the symptoms? I enjoy learning disease names and finding those that have the most interesting names. Nothing against brown patch and yellow patch, but those are pretty bland. Dollar spot is more interesting, and elephant's footprint even more so. Then there are the symptoms. 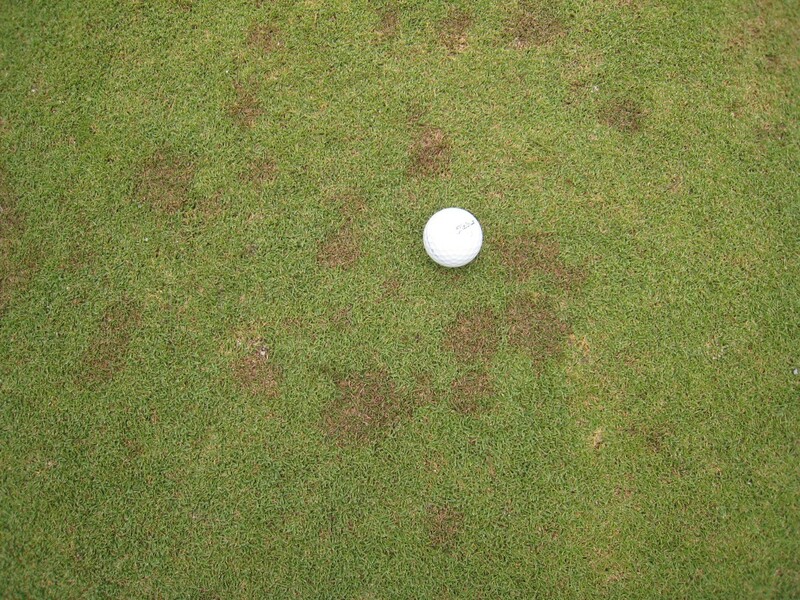 All turf diseases, if left unchecked, can make some hideous symptoms. In their standard form, however, I find some to be more hideous than others. Yellow patch, anthracnose, red thread -- often present, but sometimes only visible to those actually looking for symptoms. Compare to a disease like large patch, which in its standard manifestation is monstrous. 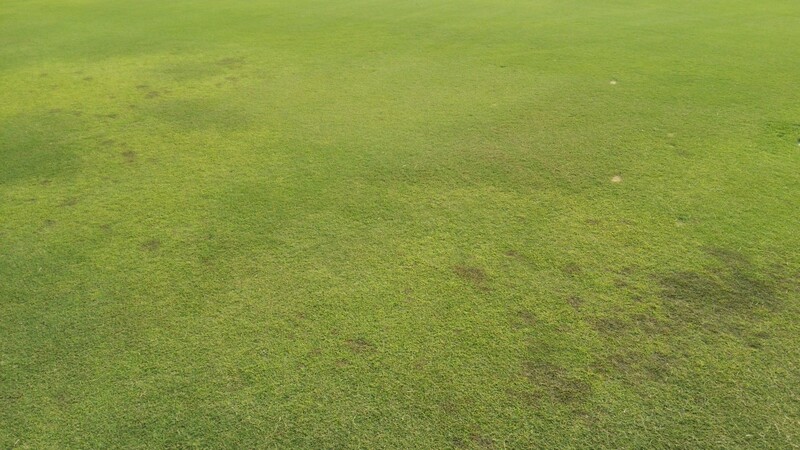 A foliar disease of these warm-season turfgrasses is often observed following prolonged or significant precipitation events such as tropical storms and hurricanes. 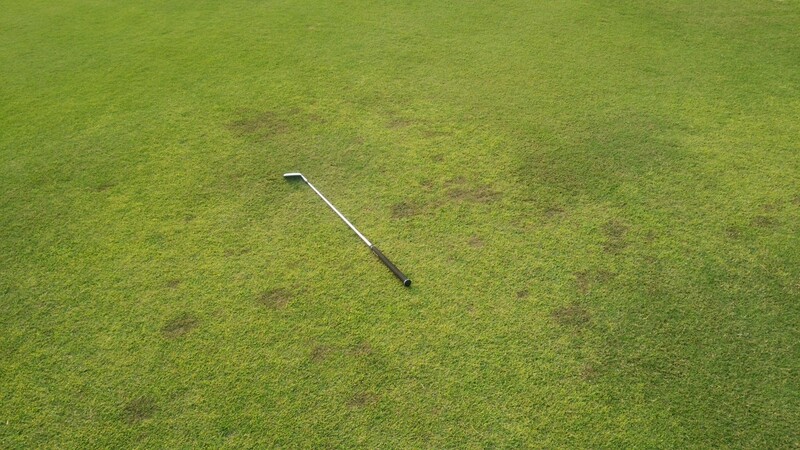 The disease manifests as distinct chocolate brown to black spots (2–15 cm diam) that appear on Cynodon dactylon or Zoysia matrella putting greens, fairways, and tee boxes. 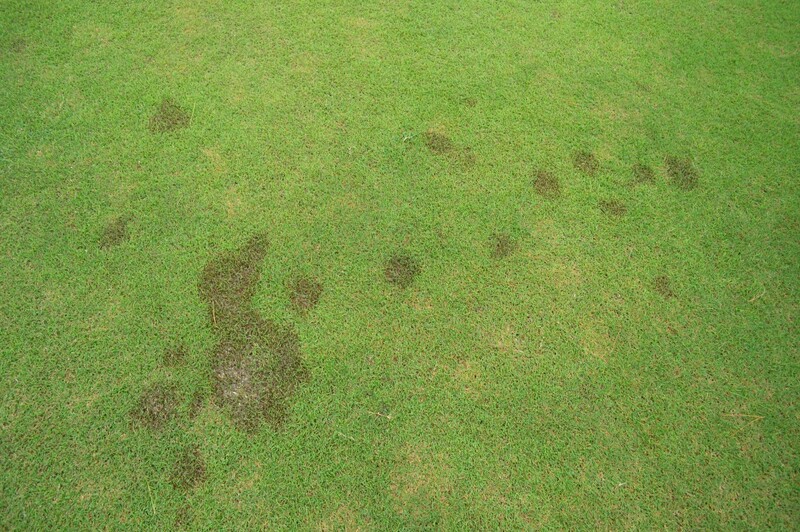 Under high disease pressure the dark spots may coalesce to form large, irregular areas of blighted turfgrass. "Is this the same as dog's footprint," I wondered? A Curvularia leaf blight affecting Zoysia spp. in Japan, referred to as dog footprint, shares symptomology to that observed on C. dactylon and Z. matrella in the southeastern United States ... Based on these reports, our hypothesis is that the sterile fungus associated with Curvularia blight and causing similar symptoms in stands of C. dactylon and Z. matrella in the southeastern United States is a novel species of Curvularia. The species was identified as Curvularia malina. To date, C. dactylon and Z. matrella are the only golf course grasses from which C. malina has been isolated. Disease epidemics on Z. matrella appear to be more severe than on C. dactylon based on visual field observations. The disease is most prevalent in the spring and fall, which are normally characterized by moderate temperatures and ample precipitation. Symptoms may persist into the summer if prevailing environmental conditions remain favorable and the turfgrass experiences stress from intensive management practices. So far so good. Dog's footprint is more severe on Z. matrella in Asia than on C. dactylon. However, in Asia the disease is most prevalent in summer, or in conditions characterized by warm temperatures and ample precipitation. 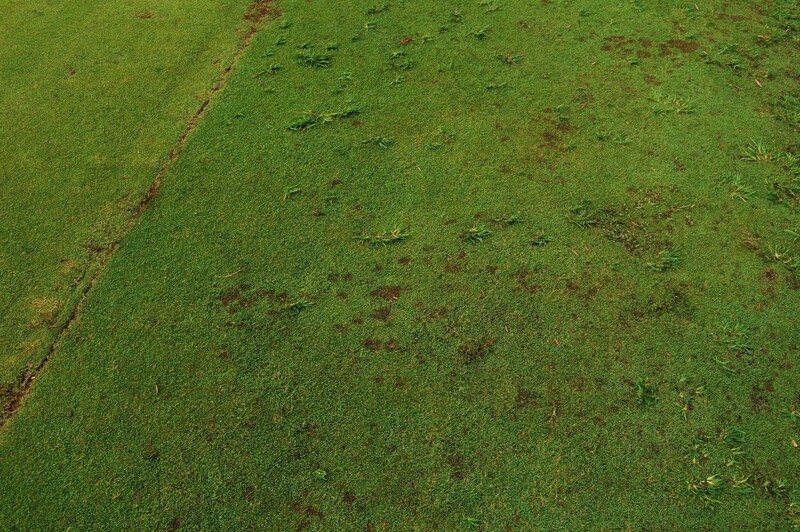 Based on the results of our research, C. malina induces disease symptoms in warm-season turfgrasses similar to those associated with Curvularia leaf blight. It seems dog's footprint is caused by C. malina. Manilagrass (Zoysia matrella) can get lots of diseases, but in a tropical environment, this species is infected by few diseases, with the most common being dog's footprint. Here is dog's footprint on manilagrass at Hilo in March. This is at Okinawa in August. This is at Manila in August. This is at Shizuoka in July. Those are pretty typical symptoms. And they are all on a monostand of one type of manilagrass. I've noticed that some manilagrass varieties are often showing dog's footprint symptoms, and other varieties rarely do. I usually see this at two different locations in the same town. For example, lots of dog's footprint at site X, and then an hour later at site Y, a slightly different type of manilagrass has no dog's footprint. Last July, I saw this at one location, on a golf course fairway with a mixed stand of different Z. matrella (korai) varieties and with some patches of C. dactylon. On one variety of korai, lots of dog's footprint. On the Cynodon and other variety of korai, none. This disease is ubiquitous on susceptible varieties in East and Southeast Asia. Finding varieties that are less susceptible seems quite possible.